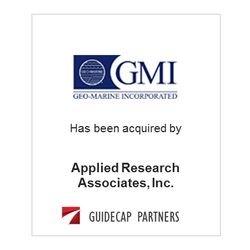 Geo-Marine, Inc. has been acquired by Applied Research Associates, Inc. (ARA). Geo-Marine is a leading engineering, energy, and environmental technology firm serving the public and private sectors worldwide. The acquisition will provide ARA with a diversified business and an expanded client and technology base. GuideCap Partners initiated the transaction and acted as financial advisor to Geo-Marine.